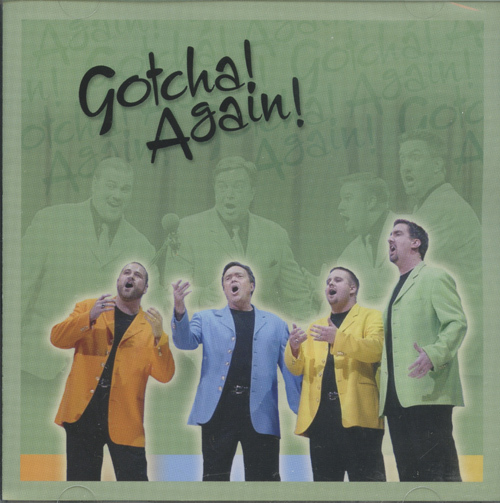 Gotcha!, four fresh-faced guys from Southern California, are famous for their live performances, matching suits in colors that even George Zimmer wouldn't guarantee, and the longest ringing barbershop chords in the business. Working their way up from being crowned 1997 Far Western District SoCal East Divisional Champions, placing 12th at the 1999 International Quartet Contest that was held in Anaheim and finally being named 2003 SPEBSQSA International Silver Medalists. "Again" has 14 breathtaking classics, "Hooray for Love," "If I Had My Way," "Honey Medley," "At The Jazz Band Ball," "When It's Night Time in Dixie Land" and the wonderful live cut, from international competition, "What More Can A Soldier Give?" Want to know our prediction for this year's SPEBSQSA Gold? Gotcha!